Home / Hitting Streaks / Is Xander Bogaerts the best hitter in Baseball? At the moment, yes. Is Xander Bogaerts the best hitter in Baseball? At the moment, yes. Xander Bogaerts said Happy Memorial Day by extending his hitting streak to an MLB best 23 games, adding two more hits. I’ve said for a long time that Bogaerts was a slow-developing star in the making; that he reminded me two years ago of a guy who would have a Derek Jeter career arc. Today, the Boston Globe had an article after the game that also raised this comparison, and asked if he is the best hitter in the league. 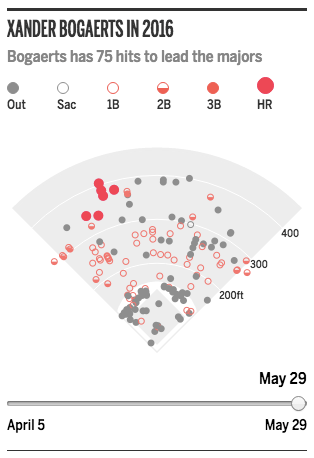 I also stole this hit chart from their article, because it’s fantastic evidence of what a complete hitter that Bogaerts is, spraying the ball all over the damn field this season. At the moment, it’s hard to really say there’s a better pure hitter in the game. And we are all about at the moment because this changes almost monthly with the way opposing teams decide to attack a guy and how that certain guy makes adjustments. Bogaerts of course hit .320 last season which is no small order in the game in any year, especially in modern day with so few overall .300 hitters to begin with left in baseball. The Red Sox by far and away have the finest lineup in all of baseball, which really only compounds the threat that is Bogaerts. He is indeed the guy there, but he doesn’t have to carry them in any way. He can just kind of remain quiet and do his damage in the shadows while everyone focuses on Big Papi, or Mookie Betts, or Jackie Bradley, or Hanley Ramirez, or Travis Shaw; and holy Hell they have a lot of firepower. We really like Bogaerts, and we did this post because he’s earned the recognition and is worth being mentioned as the best hitter in baseball today. He holds the title at the moment, for this moment in time; even if the moment is always changing in this game. A Bat Flippin’ Good Time Podcast: Is David Ortiz a Hall of Famer?